Interdisciplinarity. Each definition mentions the benefits of breaking down disciplinary boundaries, for new and more synthetic insights on today’s environmental issues. Sometimes, this includes a corollary of how the inclusion of nature and materiality lead to reconsiderations of the epistemologies of fields more traditionally concerned just with cultural matters (Blanc et al., 2017). Modes of knowledge creation. The environmental humanities favour epistemologies that accord importance to human experiences, emotions, and interpretations, acquired not primarily through ‘scientific’ methodologies but instead through interpretive, humanistic, constructivist, and other allied approaches. Modes of knowledge communication. The environmental humanities value scholarly outputs of diverse forms not restricted to impact-factor peer-reviewed journals, including for instance books, exhibits, or multimedia performances. Beauty of language, creativity, quality of narrative, and aesthetics (of websites, book covers) are celebrated almost as much as the message within. In proposing this I’m relying on a certain understanding of what “the humanities” are. For me it is not necessarily a list of disciplines (though there are obvious overlaps), it is more about the culture of knowledge creation and communication. Building on C.P. 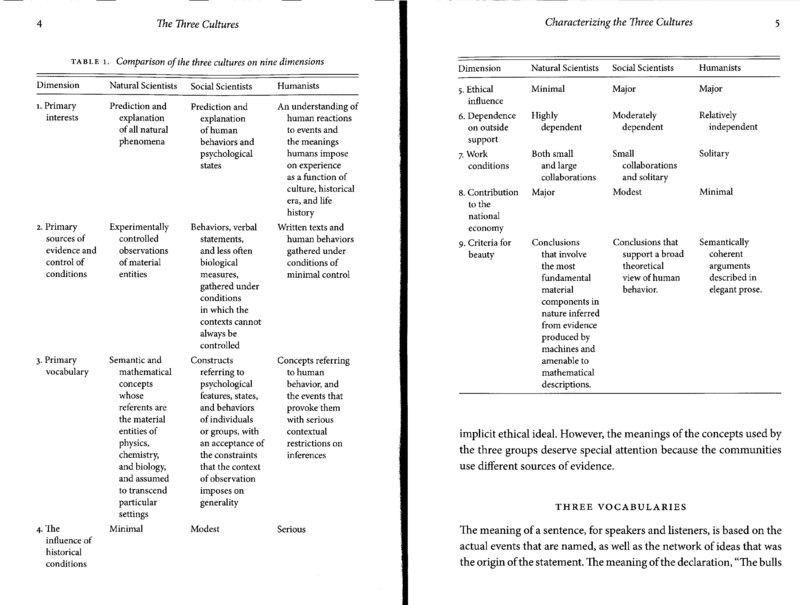 Snow’s (1959) famous work on the differences between the cultures of scientists and literary scholars, Jerome Kagan (2009) contrasts the “three cultures” of natural science, social science, and humanities. Humanists, as he calls practitioners of the latter culture, seek to understand human reactions and meanings, base their work on texts and sayings and observations “gathered under conditions of minimal control” (e.g. not experiments or surveys), and ascribe importance or beauty to “semantically coherent arguments described in elegant prose” (see his table below). Several traditional fields like geography or anthropology stretch across these three cultures, with some practitioners following the classic scientific method, others addressing social theory, and yet others expressing more interpretive epistemologies. Recognition of humanistic approaches in geography was, most obviously, the reason behind the founding of the new AAG journal GeoHumanities the year before last. Obviously these distinctions have many gray areas, and are not clear blacks-and-whites. To return to the subject, what are the advantages of my definition of environmental humanities – which emphasises a particular “culture” of approaches to the environment – as opposed to using the standard definition focused on discipline lists, interdisciplinarity, and types of knowledges? For one, it avoids limiting the environmental humanities to certain disciplinary boxes, whether history, literature, or philosophy. Second, it clarifies that the interdisciplinarity sought in many environmental humanities programs is among different practitioners of humanities-style approaches, as well as (in many cases) across the nature-society interface. Any good program in environmental studies will seek to involve people of all three cultures – as was my experience at Dartmouth College nearly three decades ago, with environmental chemists, geoscientists, and political scientists joined by ethicists and environmental writers and poets, like Noel Perrin. Third, with respect to knowledge domains, my definition is quite compatible with this aspect (the third bullet point) of the standard definition. A final point: the inspiration, timing, and lead photo of this blog came from the very recent publication of a new book from the Publications de la Sorbonne, titled Humanités environnementales (detailed flyer here), edited by Guillaume Blanc, Élise Demeulenaere, and Wolf Feuerhahn. Instead of proposing to introduce the new umbrella field or meta-discipline, it sets itself a different task. It reviews the people and politics behind the environmental turn in nine traditional disciplines, specifically anthropology, history, philosophy, geography, sociology, literature, political science, economics, and law. The chapters are fantastically detailed and deep social and cultural histories of environmental approaches in the different disciplines, all of which contribute to today’s dynamic discussions of the environmental humanities. Sub-fields considered include cultural ecology, anthropology of nature, environmental history, environmental ethics, political ecology, ecocriticism, green political theory, ecological economics, environmental law. (Simon Batterbury and I contributed the chapter on geography, tracing in particular the emergence of academic political ecology in France, a subject upon which I have blogged previously – preprint here). It also includes a useful chapter on the intertwined yet separate histories of the terms milieu, environment, environnement, Umwelt, and nature across academia and across languages; and a chapter highlighting the genealogy of the environmental humanities internationally and in France. In the introduction, the editors identify five common themes across the nine disparate disciplinary examples. First, of course, there is always a call on interdisciplinarity, particularly with ecology, though this appears more often wished-for than real. Second, materiality is again on the agenda, after several decades of post-structuralist turns across humanities. Third, there are ways in which looking across the nature-culture divide challenges the established epistemologies of the disciplines concerned. Fourth, environmental approaches across the nine disciplines emphasise the importance of the social and cultural perspectives of non-scientific actors like farmers or indigenous peoples. Finally, fifth, there is a common link to environmental activism across the disciplinary cases (Blanc et al. 2017, pp. 15-16). Interestingly, the book explicitly addresses both the social sciences and humanities. These are known as les sciences humaines et sociales in France, often treated together – so much so that the acronym SHS is well known (Anthropology and philosophy have much more overlap in France than in the anglophone world, for example; Elise Demeulenaere reminds me that Maurice Godelier in the 1980s played a big role in keeping the humanités and the sciences sociales together through an institutional reform in the CNRS). Les humanités has a more restrictive meaning in French (traditionally limited to languages and literature) than in English. By being so oriented towards disciplines, sub-fields within the disciplines, and interdisciplinarity as represented by the environmental humanities, I feel the book (otherwise fascinating and excellent) misses a chance to engage with the epistemological and communication aspects I raise above. Except, perhaps, that the cover image of a lonesome crowd-control bar at Monument Valley is indeed a beautiful, expressive piece of environmental humanities artwork. 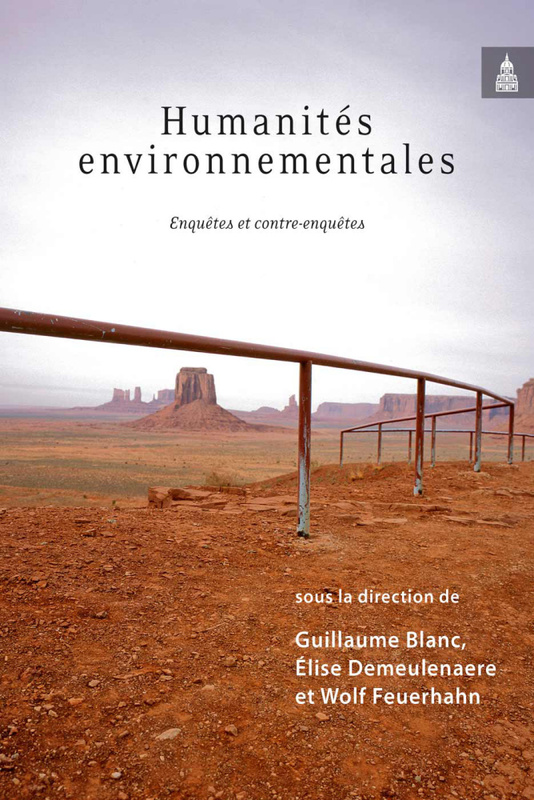 Blanc, G, E Demeulenaere & W Feuerhahn (2017) Les sciences humaines et sociales aux prises avec l’environnement. Pp. 7-18 in Humanités environnementales: enquêtes et contre-enquêtes. Paris: Sorbonne. Forêt, P, M Hall & C Kueffer (2014) Developing the environmental humanities: a Swiss perspective. GAIA 23 (1):67-69. Kagan, J (2009) The Three Cultures: Natural Sciences, Social Sciences, and the Humanities in the 21st Century. Cambridge University Press. Nye, D. et al. (2013) The emergence of the environmental humanities. Mistra background paper. Snow, CP (1959) The Two Cultures. Cambridge University Press. Positions: first Australian professorship in EH, Kate Rigby at Monash University (2013-2015), now same at Bath Spa University, at UK’s first centre for EH. This entry was posted on Friday, March 10th, 2017 at 3:31 pm and is filed under Book Review, Environmental History, Interdisciplinarity, Political ecology, Sustainability. You can follow any responses to this entry through the RSS 2.0 feed. You can leave a response, or trackback from your own site. 4 Responses to What are the environmental humanities? Indeed! Guess I wasn’t about to throw the baby out with the bathwater, but it could be read that way! Thought provoking..does the book has an English version?